French Translation To English: What Is The Difference Between Translation And Transcreation? French translation to English is a simple concept to understand, even if it is not a simple job to carry out. It is the direct translation from one language to another in written form. It does require knowledge of language, and of the culture of the countries or areas as well. Transcreation, however, is something a little different. But it is becoming more and more popular, and is something that a language translator may well be asked to carry out. Transcreation is a term that is mostly used in advertising or marketing circles. It relates to the adaptation of a message into another language whilst still keeping its meaning firmly in place. Surely this is the same as translation? Well, it is similar, but transcreation gives the translator more freedom to adapt the work as they see fit, to make sure that it makes the most sense. The words are not necessarily translation directly, but other words can be used by the translator French English expert if they put the meaning across in a better, more accurate way. Rather than staying faithful to the words, it is the meaning behind them that is translated into another language. Transcreation is most often used in slogans, advertising campaigns, taglines, brochures, web copy, branding, headlines and other marketing processes. If transcreation is not used, and simple translation is used instead, huge errors can be made, and the meaning of a document or advertising campaign might be lost altogether, and not make any sense at all. 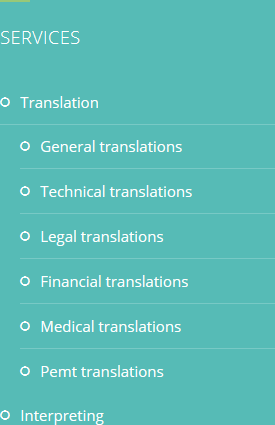 For French translation to English as well as many other languages, contact HQ-Translators. 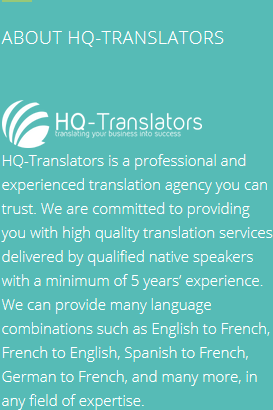 We are ready to speak to you; just phone (00 237) 242 71 38 38, or (00 237) 693 21 69 27, or email infos@hq-translators.com. 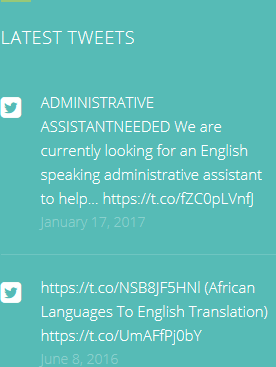 And don’t forget to look at our website at https://hq-translators.com.